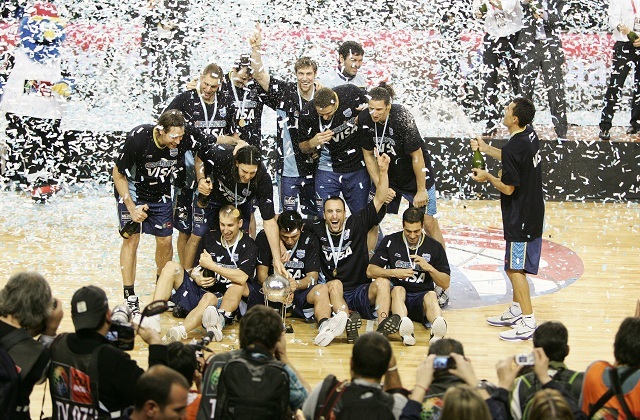 Mar del Plata, Argentina - In an Olympic duel, Argentina beat Brazil in the 2011 FIBA Americas Championship Finals and was crowned champion of the Americas. Luis Scola was the highest scorer with 32 points. The game started with both teams playing intensely and fast, fighting against the other team’s defense, Argentina had a 6-5 lead in the first five minutes with all points by Scola, and after an appearance from Marquinhos with 5 points Brazil had the lead. But a quick response from Delfino with two three-pointers after good ball rotation, and a two-pointer from Scola got Argentina once again in the lead (14-8) and forced Magnano to ask for a time out. A run of 5 points from Jasen, a two-pointer from Ginobili and three consecutive steals stretched the Argentinean lead to end the first quarter 21-9. The start of the second quarter had Scola as protagonist stopping Splitter and making 4 points in the other side. A good entrance from Luz and a three-pointer helped Brazil shorten the score (25-20) making Lamas ask for a time out to stop the Brazilian attack. The game started to become sloppy and no team could score easily until Scola returned to court and dominated the rivals defense and made 6 straight points and an assist to Kammerichs to make it a 8-0 run that was key to end the half 35-27. Marquinhos at the return from the lockers was still key for the Brazilian attack starting the quarter with a three-pointer and reaching 15 points (half of his team’s score), Ginobili on the other side made a two-pointer. The Brazilian defense started to complicate the Argentinean attack, Ginobili had his third foul and with good passing the rivals got close 44-43 with 5 minutes left, making Lamas ask for a time out. However, a three-pointer from Delfino, a good defense from Oberto and Hettsheimer and another two-pointer from Scola gave Argentina life and won the quarter 50-48. An 8-0 run from Brazil, got them ahead 56-50 against an Argentinean team that could not find the basket. With the help from the crowd, a defensive adjustment and with Kammerichs key in rebounds Argentina got the lead 59-56 with 5 minutes left. The game continued to be close in the scoreboard, with both teams exchanging baskets and turn overs. Scola kept pushing the offense and moved easily inside the Brazilian defense and with a three-pointer from Prigioni Argentina got ahead 67-62 with 1:40 left for the end. Two free throws from Scola and three from Delfino got Argentina ahead 72-63 with 1 minute left. The last moments served as a chance to define the score (80-75) of the game and crown Argentina 2011 Champions of America. After the game, Scola was named Most Valuable Player of the tournament and along with his teammate Manu Ginobili made the All Star Team of the Championship, also with Marcelino Huertas, Carlos Arroyo and Al Horford.